We’re all about fiery Brazilian spices this year. 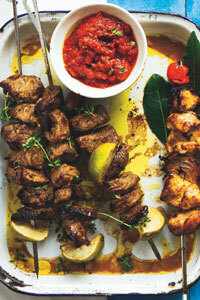 Spicy seasonings give meat a great flavour, so give these kebabs a whirl the next time you’ve got the barbecue out. 1. Take a large sealable container – tip in the olive oil and red wine or balsamic vinegar. Stir to combine. Add the lamb, then sprinkle with the Brazilian BBQ Marinade Mix. 2. Sprinkle over the thyme, lime juice and zest and garlic. Stir to combine. Seal and chill for a few hours. 3. Put the chicken into another sealable container and sprinkle on the Peri-Peri Rub. 4. Sprinkle over the olive oil, lemon juice and zest, thyme, red onions and bay leaves. Stir to combine, seal, chill and marinade for a few hours. 5. Heat grill to high. Thread marinated meat on to skewers, adding a lime wedge to the lamb and a Peppadew to the chicken. Grill for 15-20 mins, turning as needed until the meat is cooked through and browning. Serve with the G’Nosh Roasted Red Pepper BBQ Dip.